First let me say that what follows is not traditional sushi. Perhaps I shouldn’t even call it that. For those purists out there who think that you have to use white sushi rice in order to make sushi, I officially rename this meal Interesting Stuff Wrapped in Seaweed. But for brevity’s sake, I will refer to it here as Sushi. Last night I made 5 different combinations of vegetable sushi, 4 with brown rice and 1 with no rice at all (especially for those of you following a low-grain or low-carb diet). I’ve been hesitant to use brown rice in sushi because I thought it would be hard to work with and not taste good, but I have to say that I think I’ve hit on the secret for delicious brown rice sushi: Lundberg Short-Grain brown rice. It may not look as pretty as traditional sushi rice, but we hardly noticed the difference as we were devouring these vegetable rolls last night. To make the rice, I used more water than the Lundberg package suggests, at least a cup more. I started off 1 cup of rice in my rice cooker with the suggested 2 cups water, but when it was finished cooking and still not “sticky” enough for sushi, I added more water, hit the “cook” button, checked it when it shut off a second time, added more water, and just let it cook on the “warm” setting. The result was less sticky than sushi rice, but very workable. I removed it to a bowl to cool and added about 1/4 cup of sushi rice vinegar and a sprinkle of toasted sesame seeds. Along with the sushi we had the remaining roasted asparagus (I roasted a whole bunch, and it was incredibly good), the remaining avocado, and some boiled edamame. It was a great meal, but the kitchen was a disaster afterward! I think I’ll save my sushi-making for the weekend from now on. I had tried and failed previous to make good sushi, but the tips in this blog really helped me, love your blog btw. I don't do white rice or pasta, but I loooooove brown rice veggie-only sushi. I have never tried adding tofu, although as a 10-year vegan I love it; so thanks for the ideas. the low carb sushi looks fantastic! How did you “glue” the edge of the nori down? Before you completely roll it up, moisten the edge with a little water and it will seal when it overlaps. For the Low Carb I have heard of people “ricing” cauliflower, and heating it up for 30 seconds or so and then using it, might be worth looking into. I am not daring enough to try it yet. I just took a sushi class, and I am really lookingt to try making sushi with the brown rice. When all was said and done how much water did you use to one cup of rice? And it waorked well, was it sticky enough to use to make california rolls out of? or whatever they call the rice on the outside? Yes! I have a sushi kit that I have been dying to use, and now I think I will break it out. I don’t do rice, but I do do cauliflower “rice”, like the previous comment suggested. Rice the cauliflower and then steam it until desired texture. What are your thoughts on the cauliflower rice, does it get teh sticky texture, I dont expect the saem flavor.. but just steaming it no vinegar or anything like that? It doesn’t have to have fish in it to be called sushi! Sushi is the Americanization of “seshi” which in Japanese just refers to the rice. 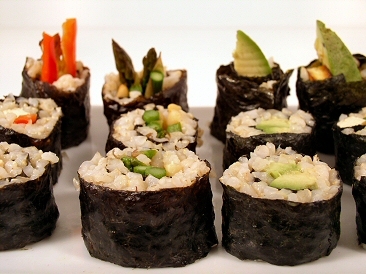 As long as you use vinegared Japanese rice, you can call it sushi! Looking forward to checking out your veg sushi post. I have food allergies (rice, nuts, corn and scallions) and used to like to eat Sushi the California Rolls and Crab tempura were my favorites but now I can’t eat rice so i’ve been looking for a way to make Sushi without rice. Is it easy to make with the Sushi kit, I have to buy one now. Hi! I am considering making sushi, and although I think that I have something that I could substitute as a bamboo mat, I was wondering where they are available for purchase. More importantly, where are the seaweed squares available? Would Kroger or Rainbow have them? Rainbow definitely has the nori (seaweed) and there’s a good chance that Kroger does, too. Both stores may have the mats, but you have a better chance of finding them (as well as the nori) at the new Oriental Grocery on the I-55 frontage road next to Big Lots. If you can’t find them, you can use a dish towel (one of the cotton ones, not terry cloth) instead. 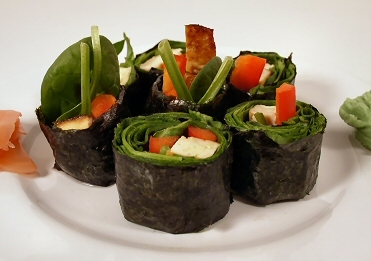 They’re useful mainly for helping lift the edge of the nori to begin the roll and for applying even pressure as you roll. Have fun! I found the Nori at Rainbow, and improvised for the mat. They were great. Thanks so much! What about using granulated TVP as a rice substitute? I make this type of sushi all the time. I usually just use whatever rice I have, but the short grain works best. I add 25-50% more water to the rice than usual and over cook it a bit. Then I smash it with the paddle which breaks the grains up a bit and helps them stick together. That’s how I’ve gotten the my rolls to hold together the best. My FAV vegetable in my rolls is lightly steamed asparagus combined with avocado. It’s awesome. Don’t forget the wasabi! I am thinking that mushing up the tofu and mixing it with some cooked veg to get it the texture of rice would be nice. If I do it I’ll let you know. I am trying to eat less carbs but really want sushi. Yes, any kind you like. I’m so glad to know I’m not the only one making non-traditional sushi. One of my favorites is the old carribean beans-and-rice in a seaweed roll. I make beans and rice with at least 6 different kinds of beans – so pretty! – and then I just slop it onto a sheet of nori, and voila. I stopped eating salads out of bowls, too – I roll them up in seaweed and eat it out of my hand (if you cut it it will fall apart). Basically, if it can be rolled into seaweed, I roll it into seaweed. But try the rice and beans – it’s terrific with soy sauce and a few olives either mixed in or on the side. I love sushi, however I do not like the taste of the nori. Is there anything out there to replace the nori? The secret to making the rice sticky is to rinse it before cooking! And rinse it until the water runs clear. In cold water, of course.